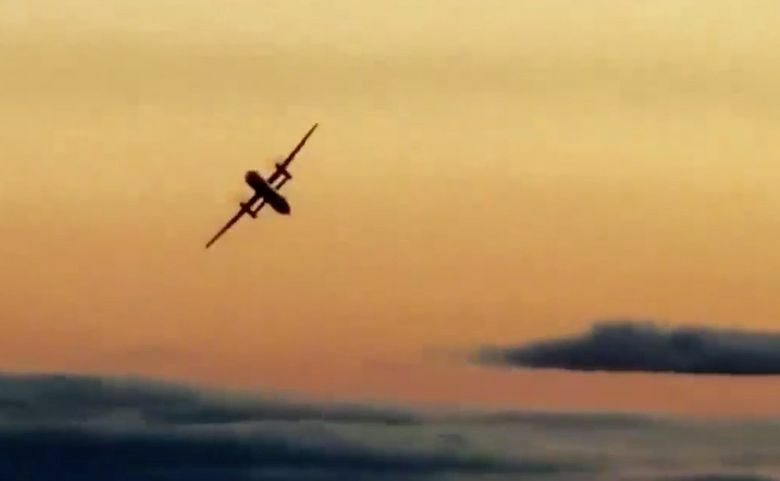 Eyewitnesses, Sea-Tac passengers, airport audio and other accounts create a detailed look at the chaos that unfolded as a Horizon Air employee stole a plane and crashed it on Ketron Island in south Puget Sound on Friday night. At about 7:30 p.m. Friday, someone in the air traffic control tower noticed the Horizon Air plane lining up at the middle of Seattle-Tacoma International Airport’s three runways. An air traffic controller asked the pilot of the twin-engine turboprop to identify himself. “Aircraft on Charlie lining up runway 16C, say your call sign.” No response. From the cockpit of an Alaska Airlines jet below, the pilot radioed to say the smaller turboprop plane was taking off, wheels smoking as it accelerated down the runway. About an hour and 10 minutes later, airline and law-enforcement officials say, a Horizon ground-crew employee, Richard Russell, crashed the plane he had commandeered into a wooded area of Ketron Island in south Puget Sound. Believed to be the only occupant, he is presumed dead. In between, Russell went on what Pierce County Sheriff Paul Pastor called “a joyride gone terribly wrong,” performing aerial acrobatics as a calm air traffic controller tried to talk him down safely. The rogue flight halted air traffic at the nation’s ninth-largest airport for more than an hour, caused air-defense authorities to scramble fighter jets from Portland, and raised questions about how someone could have stolen an aircraft in an era of heightened airport security. The Horizon Q400, tail No. N449QX, had landed at Sea-Tac at 1:35 p.m. after a short flight from Victoria, B.C. It was the plane’s last scheduled flight of the day, and it was subsequently parked at a cargo and maintenance area in the northeast corner of the airport. Russell, 29, worked as a ground-service agent, handling baggage and cargo and helping to tow planes. He worked a shift on Friday, his employer said. At some point, the authorities say, Russell got into a pushback tractor, attached it to the aircraft and turned the airplane 180 degrees, toward the runways. Ben Schaechter, on his way to San Jose, California, for a wedding, said he was in a plane accelerating for takeoff when the pilot slammed on the brakes. The Alaska Airlines Boeing 737 came to a stop halfway down the runway. “Everyone was very calm,” he said. But they knew something was wrong. The pilot, he said, got on the intercom to say another pilot had taken off ahead of them without permission. Speaking with an air traffic controller on the ground-control frequency normally used to guide planes to the runway, Russell talked about circling Rainier, or heading over to the Olympic Mountains. He was at turns giddy and apologetic. Apparently unfamiliar with many of the controls of the plane he was flying, Russell was aware of at least one indicator. At about 8 p.m., the controller tried to guide Russell to land at Joint Base Lewis-McChord, one of several attempts to coax him to find a runway or take the plane over the water. About 130 miles south of Sea-Tac, two F-15C jets of 142nd Fighter Wing, on alert round-the-clock to defend an area between Northern California and the San Juan Islands, took off. “They just came in screaming,” Funk said. The jets banked hard, he said, making a sweeping J in the sky as they turned south to match the heading of the airliner. At 8:17 p.m., Kat Treichel was waiting for a ride to Anderson Island at the Steilacoom ferry terminal. She was greeted by an air-show-like display: a turboprop flying low toward the southwest, a fighter jet matching its movements a few hundred feet off its right wingtip. She took a smartphone video and sent it to her son, a new engineer at Boeing. Russell, by that point, was doing stunts, asking the air traffic controller what the plane was capable of doing and testing its limits. Rick Christenson, a retired Horizon employee, saw the plane dive toward the water from the deck of his cousin’s home looking out on the Tacoma Narrows Bridge. “We were all screaming, ‘Oh my god, oh my god,’ and I was yelling, ‘Pull up, pull up,’ ” Christenson said. Russell was able to pull out of the dive. The air traffic controller continued to urge Russell to aim for a runway, suggesting a small airport near Tacoma. At 8:47 p.m., Russell told the controller he suspected he had trouble with one of his engines. The controller replied that he should stay out over the water. Wayne and Sharon Dequer, Ketron Island residents for the past five years, knew something was wrong as soon as they heard the plane. Jets often fly overhead from the south on the way to Sea-Tac. This time, she said, the noise was coming from the north. Back at Sea-Tac, and about an hour after screeching to a halt on the runway, the plane Schaechter was on returned to the terminal, passengers descending a mobile staircase onto the tarmac. About 75 flights were delayed by the time operations at the airport resumed. Nine were diverted to other airports, and five were canceled. The airport wouldn’t return to normal operations until the early hours of Saturday morning. Gordon, driving past the ferry at Steilacoom after 9 p.m. Friday, found firefighters crowded on the dock, waiting for a ferry to take them to the island. On the water, two police speedboats headed for Ketron. The plane had crashed near the southern tip of the island, its wings sheared off and the fuselage resting upside down. A 2-acre brush fire was still smoldering Saturday morning. Treichel, who saw smoke rising from Ketron Island, didn’t connect it to the plane until her son called to say the aircraft they had just seen had gone down. “What a sad, surreal evening,” she said.